امرا, مصطفی, رنجبر, خلیل, حسینی, سیدعلی. (1396). تأثیر افزودن اکسید سریم بر رفتار سایشی و خوردگی نانو کامپوزیت سطحی Al5083/CeO2 ساخته شده به روش فرآیند اصطکاکی اغتشاشی. 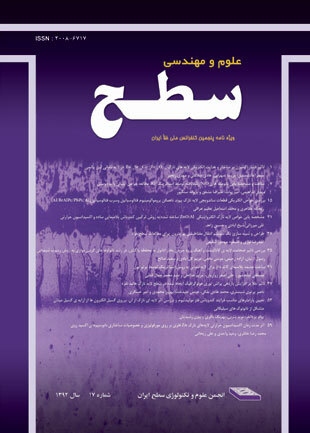 نشریه علوم و مهندسی سطح, 13(32), 51-63. مصطفی امرا; خلیل رنجبر; سیدعلی حسینی. "تأثیر افزودن اکسید سریم بر رفتار سایشی و خوردگی نانو کامپوزیت سطحی Al5083/CeO2 ساخته شده به روش فرآیند اصطکاکی اغتشاشی". نشریه علوم و مهندسی سطح, 13, 32, 1396, 51-63. امرا, مصطفی, رنجبر, خلیل, حسینی, سیدعلی. (1396). 'تأثیر افزودن اکسید سریم بر رفتار سایشی و خوردگی نانو کامپوزیت سطحی Al5083/CeO2 ساخته شده به روش فرآیند اصطکاکی اغتشاشی', نشریه علوم و مهندسی سطح, 13(32), pp. 51-63. امرا, مصطفی, رنجبر, خلیل, حسینی, سیدعلی. تأثیر افزودن اکسید سریم بر رفتار سایشی و خوردگی نانو کامپوزیت سطحی Al5083/CeO2 ساخته شده به روش فرآیند اصطکاکی اغتشاشی. نشریه علوم و مهندسی سطح, 1396; 13(32): 51-63. در تحقیق حاضر، نانو کامپوزیت سطحیAl5083/CeO2 با افزودن نانو ذرات اکسید سریم(CeO2) به سطح آلیاژ آلومینیم 5083 توسط فرآیند اصطکاکی اغتشاشی ایجاد گردید. ریزساختار، رفتار سایشی و خوردگی فلز پایه، نمونه­ تحت فرآیند بدون ذرات تقویت­کننده و کامپوزیت سطحی Al5083/CeO2 مورد بررسی قرار گرفت. بررسی­های ریزساختاری توزیع یکنواخت ذرات تقویت­کننده را در ناحیه­ اغتشاشی نشان داد. در مقایسه­ با فلز پایه، نمونه­ کامپوزیتی سختی بیشتر و خواص سایشی بهتری را در آزمون سایش از خود نشان داد. حضور نانو ذرات اکسید سریم در ناحیه­ تحت اغتشاش، سبب بهبود قابل ملاحظه­ خواص خوردگی، یعنی ایجاد ناحیه­ پسیو بزرگ و کاهش 95 درصدی چگالی جریان خوردگی(icorr) کامپوزیت حاصل نسبت به فلز پایه شد. نتایج بررسی­ها نشان داد که افزودن ذرات اکسید سریم موجب بهبود قابل ملاحظه رفتار سایشی و خوردگی آلیاژ 5083 بطور همزمان می­گردد. 1. J. W. Bray, Aluminum Mill and Engineered Wrought Products, Properties and selection: nonferrous alloys and special purpose materials, ASM Handbook, ASM International, 2(1999)118-360. 2. M. Sharifitabar, A. Sarani, S. Khorshahian and M. Shafiee Afarani, Fabrication of Al5052/Al2O3 nanoceramic particle reinforced composite via friction stir processing route, Materials and Design, 32(2011)4164-4172. 3. J. Qu, H. Xu, ZH. Feng, D. Alan Frederick, L. An and H. Heinrich, Improving the tribological characteristics of aluminum 6061 alloy by surface compositing with sub-micro-size ceramic particles via friction stir processing, Wear, 271(2011)1940-1945. 4. R.S. Mishra, Z.Y. Ma and I. Charit, Friction stir processing: a novel technique for fabrication of surface composite, Materials Science and Engineering A, 341(2003)307-310. 5. R.S. Mishra and Z.Y. Ma, Friction stir welding and processing, Materials Science and Engineering R, 50(2005)1-78. 6. E.R.I. Mahmoud, M. Takahashi, T. Shibayanagi and K. Ikeuchi, Wear characteristics of surface-hybrid-MMCS layer fabricated on aluminum plate by friction stir processing, Wear, 268(2010)1111-1121. 7. I. Aziz, Z. Qi and X. Min, Corrosion inhibition of SiCp/5A06 aluminum metal matrix composite by cerium conversion treatment, Chinese Journal of Aeronautics, 22(2009)670-676. 8. P.M. Ashraf and S.M.A. Shibli, Reinforcing aluminium with cerium oxide: a new and effective technique to prevent corrosion in marine environments, Electrochemistry Communications, 9(2007)443-448. 9. P.M. Ashraf and S.M.A. Shibli, Development of cerium oxide and nickel oxide-incorporated aluminium matrix for marine applications, Journal of Alloys and Compounds, 484(2009)477-482. 10. L. Yang, X. Pang, G. Fox-Rabinovich, S. Veldhuis and I. Zhitomirsky, Electrodeposition of cerium oxidefilms and composites, Surface & Coatings Technology, 206(2011)1-7. 11. J.Q. Su, T.W. Nelson and C.J. Sterling, Microstructure evolution during FSW/FSP of high strength aluminum alloys, Materials Science and Engineering A, 405(2005)277-286. 12. P.B. Prangnell and C.P. Heason, Grain structure formation during friction stir welding observed by the stop action technique, Acta Materialia, 53(2005)3179-3192. 13. J.Q. Su, T.W. Nelson, R. Mishra and M. Mahoney, Microstructural investigation of friction stir welded 7050-T651 aluminium, Acta Materialia, 51(2003)713-729. 14. T. R. McNelley, S. Swaminathan and J.Q. Su, Recrystallization mechanisms during friction stir welding/processing of aluminum alloys, Scripta Materialia, 58(2008)349-354. 15. A. Dolatkhah, P. Golbabaei, M. K. Besharati Givi and F. Molaiekiya, Investigating effects of process parameters on microstructural and mechanical properties of Al5052/SiC metal matrix composite fabricated via friction stir processing, Materials and Design, 37(2012)458-464. 16. L.B. Johannes, I. Charit, R.S. Mishra and R. Verma, Enhanced superplasticity through friction stir processing in continuous cast AA5083 aluminum, Materials Science and Engineering A, 464(2007)351-357. 17. M.A. García-Bernal, R.S. Mishra, R. Verma and D. Hernández-Silva, Hot deformation behavior of friction-stir processed strip-cast 5083 aluminum alloys with different Mn contents, Materials Science and Engineering A, 464(2007)351-357. 18. M. Barmouza, M. K. Besharati Givi and J. Seyfi, On the role of processing parameters in producing Cu/SiC metal matrix composites via friction stir processing: Investigating microstructure, microhardness, wear and tensile behavior, Materials Characterization, 62(2011)108-117. 19. S. Soleymani, A. Abdollah-zadeh and S.A. Alidokht, Microstructural and tribological Properties of Al5083 based surface hybrid composite produced by friction stir processing, Wear, 278-279(2012)41-47. 20. G.R. Cui, Z.Y. Ma and S.X. Li, The origin of non-uniform microstructure and its effects on the mechanical properties of a friction stir processed Al–Mg alloy, Acta Materialia, 57(2009)5718-5729. 21. K. Huang, T. Lui, L Chen, Effect of microstructural feature on the tensile properties and vibration fracture resistance of friction stirred 5083 Alloy, Journal of Alloys and Compounds, 509(2011)7466-7472. 22. Y. S. Sato, S. H. C. Park and H. Kokawa, Microstructural factors governing hardness in friction-stir welds of solid-solution-hardened al alloys, Metallurgical and Materials Transactions A, 32A(2001)3033-3042. 23. P. Asadi, M.K. Besharati Givi, K. Abrinia, M. Taherishargh and R. Salekrostam, Effects of SiC Particle Size and Process Parameters on the Microstructure and Hardness of AZ91/SiC Composite Layer Fabricated by FSP, Journal of Materials Engineering and Performance, 20(9)(2011)1554-1562. 24. C. Maxwell Rejil, I. Dinaharanb, S. J. Vijayb and N. Muruganc, Microstructure and sliding wear behavior of AA6360/(TiC + B4C) hybrid surface composite layer synthesized by friction stir processing on aluminum substrate, Materials Science and Engineering A, 552(2012)336-344. صالحی مهدی، اشرفی­زاده فخرالدین، متالورژی سطح و تریبولوژی، انجمن علوم و تکنولوژی سطح ایران، سال 1374. 26. R. Palanivel, I. Dinaharan, R.F. Laubscher and J. Paulo Davim, Influence of boron nitride nanoparticles on microstructure and wear behavior of AA6082/TiB2 hybrid aluminum composites synthesized by friction stir processing, Materials and Design, 106(2016)195-204. 28. M. Narimani, B. Lotfi and Z. Sadeghian, Evaluation of the microstructure and wear behaviour of AA6063-B4C/TiB2 mono and hybrid composite layers produced by friction stir processing, Surface & Coatings Technology, 285(2016)1-10. 30. S.H. Aldajah, O.O. Ajayi, G.R. Fenske and S. David, Effect of friction stir processing on the tribological performance of high carbon steel, Wear, 267(2009)350-355. 31. A.M. Hassan, A.T. Mayyas, A. Alrashdan and M.T. Hayajneh, Wear behavior of Al–Cu and Al–Cu/SiC components produced by powder metallurgy, Journal of Material Science, 43(2008)5368-5375. 32. M. Trueba and S. P. Trasatti, Study of Al alloy corrosion in neutral NaCl by the pitting scan technique, Materials Chemistry and Physics, 121(2010)523-533. 33. A. Aballe, M. Bethencourt, F. J. Botana, M. J. Cano and M. Marcos, Influence of the cathodic intermetallics distribution on the reproducibility of the electrochemical measurements on AA5083 alloy in nacl solutions, Corrosion Science, 45(2003)161-180. 34. Y. Yang and T. Allen, Direct visualization of β phase causing intergranular forms of corrosion in Al–Mg alloys, Materials Characterization, 80(2013)76-85. 35. G. R. Argade, K. Kandasamy, S. K. Panigrahi and R. S. Mishra, Corrosion behavior of a friction stir processed rare-earth added magnesium alloy, Corrosion Science, 58(2012)321–326. 36. G.S. Frankel, Pitting Corrosion, Corrosion: fundamentals, testing, and protection, ASM Handbook, ASM International, 13A(2003)590-605. 37. X. Yu, C. Cao, Z. Yao, D. Zhou, and Z. Yin, Study of double layer rare earth metal conversion coating on aluminum alloy LY12, Corrosion Science, 2001(43)1283-1294. 38. M. Bethencourt, F. J. Botana, J. J. Calvino, M. Marcos and M.A.R. chacon,Lanthanide compounds as environmentally friendly corrosion inhibitors of aluminium alloys: a review, Corrosion Science, 40(11)(1998)1803-1819. 39. T. N. Rhys-Jones, H. J. Grabke and H. Kudielka, The effects of various amounts of alloyed cerium and cerium oxide on the high temperature oxidation of Fe-10cr and Fe-20Cr alloys, Corrosion Science, 27(1)(1987)49-73.